Product Catalogue > DVD > Male Bodybuilder DVDs > THE RIPPED COLLECTION ON DVD WITH CLARENCE BASS - 3 DVD SET Ripped 1, 2 and 3. THE RIPPED COLLECTION ON DVD WITH CLARENCE BASS - 3 DVD SET Ripped 1, 2 and 3. The Ripped DVD Triple Pack - now in a single case!! 3 DVD SET - Ripped 1, 2 and 3. All 3 videos are also on Digital Download. See individual links below to each DVD. We are now offering the RIPPED DVD TRIPLE PACK as 3 DVDs in one case, to save on postage and handling. 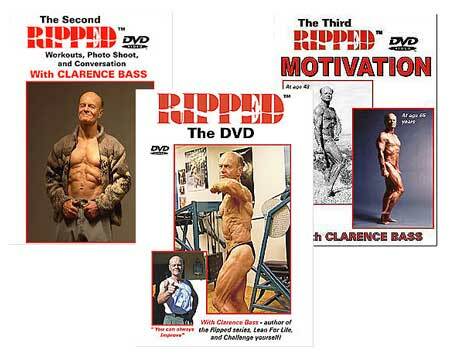 This is a superb 3 DVD set featuring the complete RIPPED DVD video series from legendary strength and healthy lifestyle guru Clarence Bass. Clarence Bass, the living embodiment of the word "Ripped", has achieved unprecedented levels of lean muscularity through healthy living. Winner of his height division in the "Past - 40" Mr. America and Mr. USA (and "Best Abdominals", "Best Legs" and "Most Muscular", as well), his image and his principles of diet and exercise have led people around the world to stronger and healthier lives. This DVD shares with you his secrets. In 2003 Clarence Bass was the special Guest of Honor at The Association of the Oldetime Barbell and Strongmen Historic 20th Annual Reunion and Dinner in New Jersey. In his first DVD, RIPPED #1, Clarence Bass, an acknowledged master of staying lean fit and healthy, shares the knowledge gained from a lifetime quest for improvement, including many different chapters. * Training diary to motivate. * Lower ab and oblique training. Clarence Bass, the living embodiment of the word "Ripped", has achieved unprecedented levels of lean muscularity through healthy living. This DVD shares with you his secrets. * Behind the scenes at photo shoot. * Diet and weight training. * Whole Body weight workout. * Aerobic fitness and fat loss. * Treadmill interval workout demonstrated by Wayne. Completely different, this third DVD is about motivation, the sine qua non of all successful training efforts. No worthwhile fitness goal can be achieved without motivation. Using real life stories, it shows you how to stay motivated year after year. Now at the SPECIAL SET PRICE OF $79.95 for all 3. For full descriptions of EACH INDIVIDUAL DVD, please click on the links below to RIPPED 1, 2 & 3. Special postage cost for this set is now only $7.50 as a single item. Check out the 10 books we have in stock by Clarence Bass click here. There is also a SPECIAL DEAL 3 BOOK SET FOR RIPPED 1, 2 & 3. Click here for this set B-0289SP. Click here to read a great article on Clarence Bass.